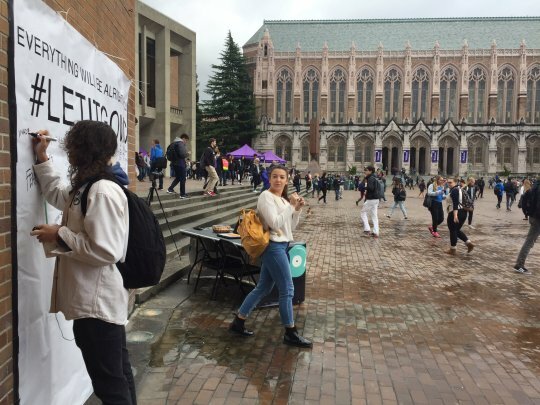 ASUW Arts and Entertainment set up a successful UW On Campus Fan Activation event today in Red Square for artist Mondo Cozmo. The event was a banner signing for their new single, “Shine”. 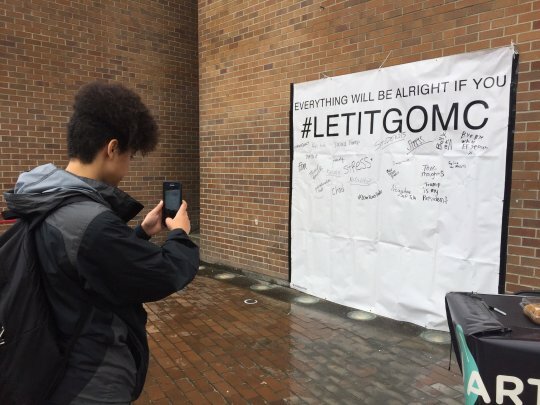 The banner read: “Everything Will Be Alright If You #LETITGOMC” and had space for passersby to write what they wanted to let go. By the end of the signing, the banner was full of a variety of responses, from “Harambe”, “chem” and “Nickleback” to more serious things, like “fear”, “stress”, and “doubt”. During the event, people commented that writing down what they wanted to let go was “therapeutic” for them. Finding the banner seemed to be good timing for many students currently feeling the stress of midterms and the nearing end of the quarter. Several people posted to twitter with the hashtag #Letitgomc and took photos with their contributions to the banner. You can find more info on Mondo Cozmo on their website.